I got this in my inbox the other day. …but I must humbly request just ONE non-Wow-related blog entry. Only one. And then you can WoW report us to death for the next dozen months. I know, I know, this is your vehicle of expression and I have no right to drive it, but there was a time when you would blog about Not-WoW quite naturally–without special request from your fans. What do you say, man? Sneak one “mundane” blog entry in there before the rest of the world drops into Burning Crusade with you. Besides, if you’re playing all this WoW, how are you playing Trauma Center on the Wii? But! That is not the point here! Let it never be said that the darklord does not respect the requests of his fan(s)! Non-WoW-related post you want? Non-WoW-related post you shall get!!! …mostly because there’s something I’ve been meaning to talk to you about anyway. That something is my recent love affair with Guitar Hero. 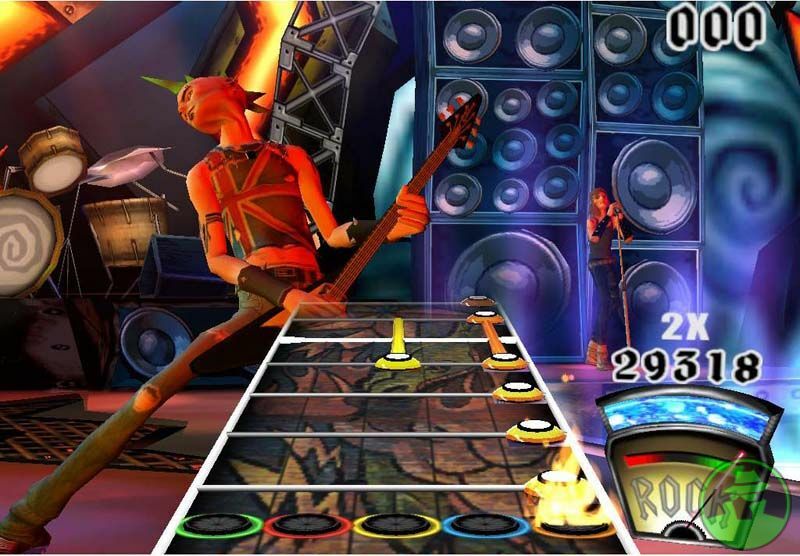 For those of you living under a sand dune in Darkest Escarpion, Guitar Hero is something of an out-of-left-field smash hit rock-and-roll rhythm game, who’s sequel (the aptly named Guitar Hero 2) came out just last week. It’s… a game where you play air guitar for points. Pretty much. Note that I did not say it is indistinguishable from a guitar. Because, of course, it is in practice, comparing the mini-Gibson here to a real guitar is a little like comparing a kazoo to a trumpet. True, both require breath to make noise, and both require some skill (in varying amounts) to operate… but there is where the similarities end. One is a maker of sound, and the other is an instrument. It’s unbelievably fun. And, I’m really good at it. Now, I wouldn’t normally make such a bold claim. Modesty is, after all, a virtue, and it is important to keep your perspective in such things: there is always someone better than you out there, and it’s best not to over-celebrate your own successes. I feel these things to be true, in my bones, and in no way wish to misrepresent my accomplishments. Before we talk about that, though, I wanna break this game down for you a bit, and discuss its genius. It’s one hell of a game. In this game, colored dots scroll at you while a song is playing (see above for screen shot), and you have to “play” the right “note” at the right moment. If you succeed, yaay, if you miss, boo. “Playing” a note means pressing the right colored button, and “strumming” the little lever that represents the strings. It feels amazingly like playing a guitar, in practice. There are four difficulty levels in the game – Easy, Medium, Hard, and Expert. In “Easy” mode, you only ever have to worry about three of the five buttons. This is nice for the uncoordinated, as you never have to move your hand, and the notes come at you in a nice, liesurely pace. In “Medium”, they add the fourth button, which you have to either press with your pinky (often awkward), or shift your hand position (tricky to do). And they expect you to be able to handle faster notes, and more of them. You can imagine this, I bet: it’s a timing game, like many others, with the added cool factor that it really feels like a guitar. Hit one of four inputs, at the right time… if you played PaRappa the Rapper, you’re not too far off here. …and then the wheels come off. In “Hard” mode, a couple of important things happen. The first thing you notice right off: the notes come at you literally twice as fast as in the previous two levels. The second thing is that the fifth button starts to appear in songs, which makes the skill of relocating your hand on the neck a requirement, no longer optional. And… well, you kinda have to start playing the solos. Which means chains of tightly packed notes, all in a row. They mean it. It’s hard. The two most difficult songs (and, not surprisingly, the last two songs in the game) are Cowboys From Hell by Pantera (oh yes, yes, more metal, bring on the metal) and Bark At The Moon by Ozzy Ozbourne. It… took some time, and the development of whole new playing techniques, to overcome this obstacle. See, this is where it starts to get crazy. “Expert” mode is something completely different. Gone, too, in Expert mode, is any pretention that you will not be hitting every goddamn note the lead guitarist played in the song. In Hard, they let you off the hook here and there, and allowed some notes to “represent” note phrases. This was in order to preserve your sanity. Note to self: the Expert mode designers are trying to drive you insane. Was the sound in the song a chord? You’ll be hitting two buttons at once. Was it played at speeds few humans can even comprehend? Join in the band, brother, because that’s your job now. As an aside, I want to say that it is very strange how much playing this game is like learning an actual instrument. Anyone who has struggled with real-world instruments knows the cycle of learning one goes through, and that same cycle repeats itself here. I would go for days and days without progressing, banging my head against the same goddamn song, and then one day I would pick up my “guitar”, and a song that was insurmountable the day before would be simple. I get better at this game when I sleep. Just like the real thing. p.s. As remarkable as this accomplishment is to me, I can assure you, my performance in no way comes close to what is seen at the other end of this link. That guy, whoever he is, is my hero. Let it be known that *at the time the request was made* the number of consecutive WoW posts on this blog had gone well beyond acceptable levels. Regardless it’s nice to see the dark, uncompromising force of your obsessiveness directed at a new target. You have, of course, seen that in American-ese, “Ouendan” (meaning, male japanese cheerleader) translates into “Elite Beat Agents” (meaning cops who dance)? I, on the other hand, will *not* be playing Guitar Hero, as my pathetic attempts to master “medium” mode on Ouendan have proven beyond a shadow of a doubt that I have no rhythm. At all.